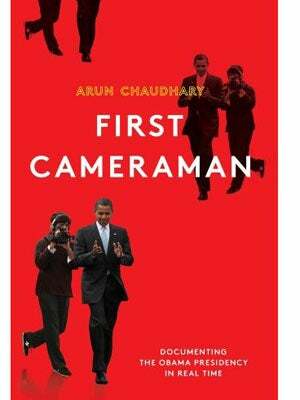 If you're looking for an end-of-summer read even more captivating (and more cerebral) than Fifty Shades of Grey, click your way over to Amazon now, and order former Obama staffer Arun Chaudhary's new book, First Cameraman: Documenting the Obama Presidency in Real Time. The book is a voyeuristic look into the president's life through Chaudhary's eyes — or lens — which covers the early months of the 2008 campaign through the first two and a half years of the Obama administration. This relentless filmmaker goes beyond dishing about a bunch of speeches (such as this engaging talk on race in Philly) to capture everything from the president throwing the first pitch in St. Louis before the All-Star game to surprising local staffers in Chicago. But this is more than just a guy following Obama around with a camera and making a video diary of sorts. The year 2008 became known as the YouTube election, which told the entire world that this president was marching to the beat of his own drum. Streaming video became an unorthodox approach to connect with the world in real time — literally. In addition, reliving moments such as his early campaign speech (that interrupted Monday Night Football), or his speech in Berlin is as easy as turning on your computer. Perhaps you even saw Obama's Grant Park acceptance speech. Well, that was uploaded from the bathroom of Chaudhary's apartment. All in a day's work.